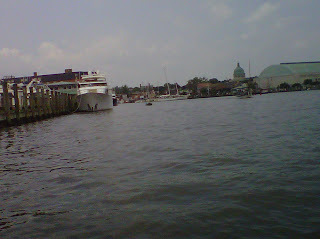 So we aren't exactly Paul Revere but we did approach Annapolis by sea this past Sunday. John's official end to vacation was a gorgeous day with a slight possibility of thunderstorms but that didn't stop us from taking the jet ski down to a Traxton start park, right outside Annapolis, and launching it for a full day of fun, sun and wild river riding. We had a great tour of the harbor with sailboats and gorgeous powerboats moored securely. The view from the water is much different than from streets and we viewed some gorgeous piers, condos and lovely homes with tricked out yards. A short 10 minute ride had us passing the Annapolis harbor and heading out to the Severn River to play on the jet ski for a bit. We were quite surprised at the large amount of chop (2 foot waves) at we turned the corner by the Naval Academy but we were game. 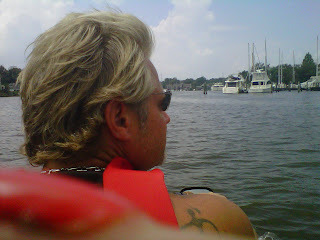 We opened the ski up and we were going places! Of course, we had nowhere particular to be but that was beyond the point. We've determined that I'm a power girl - I have a need for speed! And, speed we did! We had talked to a gentleman launching a big jet ski while we were launching ours, which is a pretty good sized 3-seater turbo. His ski had a larger engine (no turbo though - did I mention I have a need for speed?...) but that didn't mean we didn't whoop him when he came from behind and overtook us the first time. That was all John needed - the race was on! There were a few times when I almost slid off the seat as John swirled, dipped and put the ski through its paces at around 40 knots. I finally figured out that riding a bucking jet ski is akin to riding a horse (not that I know what that's like but I think the analogy fits....). Regardless, I felt the workout in my thighs today, every single time I got up! After showing the man who was, well, the MAN, we headed over to Annapolis and docked at the public dock for tenders - the jet ski is considered a tender or a dingy - go figure. Coming into the harbor, I had a flash of being 9 or 10 years old and coming into the same spot with the family on our boat, The Harmony, when we had a house on Kent Island. We used to go to the Acme foods right on the Annapolis Harbor to do our shopping and then head back across the bay to our cozy cottage. This was a much preferred travel method to Annapolis, and quicker than taking the then one-laned Bay Bridge which always seemed to be snarled. This time though, I had to buy a new dress to walk around in but I can always use a new frock. 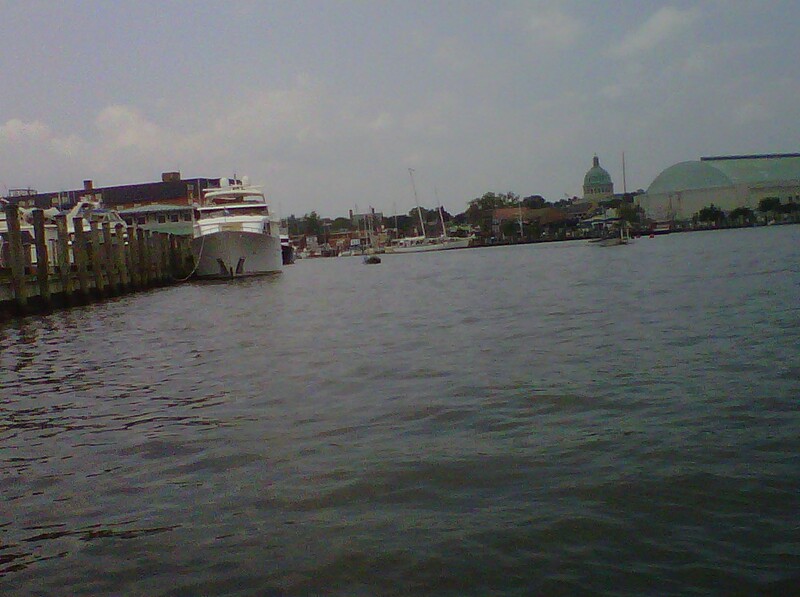 I had brought a skirt with me in the dry box but felt a bit under dressed while strolling the streets of historic, beautiful Annapolis in a bathing suit and skirt. So, a new frock was had and we headed over to a great lunch while sitting on the water over at Pussers Bar and Grill. The waterfront was alive with fellow travelers who had dropped in to listen to the acoustic guitarist and imbibe, just as we had. Had a nice chat with a couple who were there for their 35th anniversary and quite happy to be in each other's company. Nice to see. A few Dark and Stormies later, we were headed back to the jet ski to run back to the car ahead of a weather front. Of course, before we left, we had to recreate our first date and stopped in at the bar in the Harbor to have just one more cocktail. Met a delightful woman, Mary Ellen, who is 75. Her gorgeous son was the bartender that day and she started to tell me a great story. Her husband died 12 years ago. She has 7 children so, every day of the week, they rotate driving her wherever she needs to go. Great system she has going. She was very sweet and told me that she knew how good she had it. She certainly deserved it; she was a doll. We plan on meeting up with her again at that bar. I knew that bar was special the moment John walked in, toting his motorcycle helmet 2.5 years ago. Our drinks done, we walked over to the jet ski and a short ride later, we were headed home. 1. It's the first trip where we didn't lose anything (trip #1: my shorts; trip #2: John's shoes; trip #3: a brand new towing rope). Perhaps we've busted through the curse. 2. More importantly, there were no spills of any kind. Yeah for us!